Yes, definitely try and book a session with Steve at some point if you can. Sure, will do that. After all, I got a clean lung and heart. My liver might not be as useful. But who knows. Quite possible. We were the 3 reckless Germans, riding without helmets or other safety equipment. Needless to say that we felt quite embarrassed upon our teenage rebelliousness. Lennart Finkeldey wrote: We also met a fellow MTB'er who suggested us to use your services Steve. Thanks again for all your valuable information on the trails and how to get there. My friends and me did the ride on last Sunday and it was nothing short of expectations. Lot's of friendly MTB'ers along the trail with helpful insights and further help and how to get where we wanted. 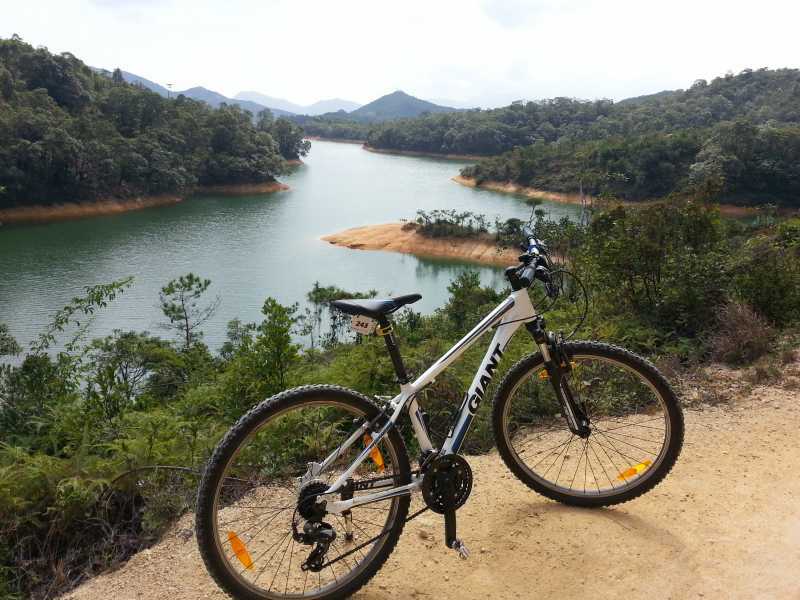 We ended riding the Tai Lam Chung trail next to the reservoir. It was really a nice ride, not too difficult although I fell to the ground once after a vertical stone made the bike stop in a split second. We also met a fellow MTB'er who suggested us to use your services Steve. We tried to follow him on the trail but the guy was just really fast. Steve, will let you know next time we are planning to to MTB'ing and use some more quality bikes, especially looking forward to FS before buying a bike from one of the brands. Hi Steve, thank you for your recommendation. Also StanleyJ and sassythebike, that's great information! Very happy with all you people's help! I am looking forward to the rides~ =) Have a nice day everyone! Familiarise yourself with the route in Google Streetview. The bit along the drainage canal is low traffic, so not a hazard even though there is no cycle lane. It'll be a ~140m climb on paved road to actually get into Tai Lam Reservoir proper. Riding in that direction should take about 45min~1hour in and 25min~45min out. A lazy ride around the reservoir with breaks for food (carry yourself) and water will take about 2~2.5hours. So a good day's worth of beginner riding there. If you're eager to hit up the trails, I had a great experience today renting a mtb from wecycles in Yuen Long. The shop has a handful of Giants for rent varying in sizes, 26", hardtail and FS. For half a day, until 3pm, I paid $50HK. The shop owner was very accomodating and threw on some SPDs for me. rs, however, were a bit much. The concrete section was fine, well worth the scenic views of the reservoir. Just make sure you don't miss the sharp left turn, lest you find yourself going through the corrections facilities and local village. With all the wrong turns leaving the city and the brief detour through the village it took me about three hours to/from the bike shop.